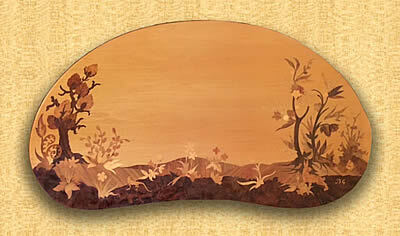 Our April update features a rather large example of the ever popular ""Chrysanthemums" flower picture by the Buchschmid and Gretaux Wood Inlay Company..
Our March update brings you three pieces of table furniture produced by the Buchschmid and Gretaux Wood Inlay Company in the late 1950's to early 1960's. 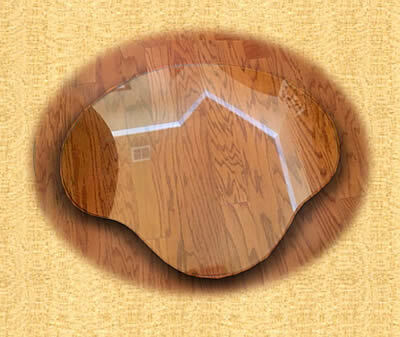 These, as you can see from the photos sent to us by their owner Marcella Stewart, consist of a main coffee table, a glass protective top shaped to fit the coffee table perfectly, and two kidney shaped side or end tables. 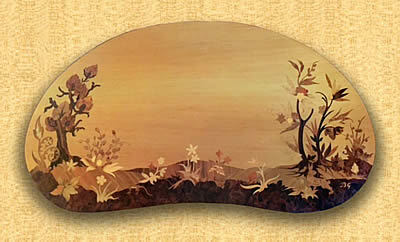 This set features a woodland scene by Buchschmid and Gretaux. We have an idea that this set may be known as the Fauna Flora design, but without the attached Buchschmid and Gretaux label, or the ABC Studios label endorsed by Otto Chlup, it is difficult to give the definitive answer to the correct appellation for this set. If any of you, our web visitors, has the same set in your possession, perhaps you would be kind enough to enlighten us as to the correct title for these lovely tables. Normally, as mentioned above, you should find a descriptive label glued underneath one of the tables - generally it is usually the main table which contains the label, but in certain circumstances B & G did attach the label under one of the side or end tables. However, if your tables have been sent for restoration at any time, then the restoration process may well have sadly seen the removal of the descriptive label. It is interesting to note that the designs on both side or end tables look identical. Well, in fact they would be virtually identical because the designs were 'packet cut' from wads of veneers around ten in number deep. This cutting method gives ten identical copies of each piece of veneer, but the differences you will note are the slight variations in grain figuring and patterning. 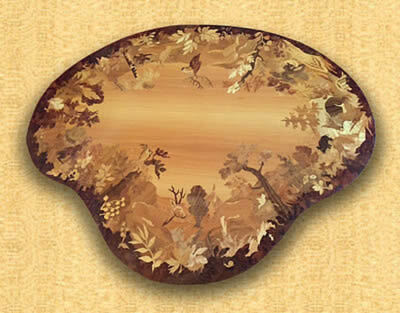 To the untrained eye these small variations are not readily visible, but to veneer specialists, such as our membership, these veneer variations are almost like finger prints - and they are as unique as them as well.! Click the above button to return to page 62 of "Can You Help"